Time travel is a staple of science fiction, and it has been given many different treatments over the years. John Rosenman gives the subject a new look when he interjects love and duty into the mix. Diana is the head of a time travel bureau, one tasked with maintaining the system for authorized users to go back and observe the past. However, one of her team, Dero, has his own agenda which is at odds with the rules, and Diana is in love with him. With "killers," androids tasked with policing the past, ready to take out unauthorized time travelers, Diana has a difficult task in keeping Dero in check. One problem with most short stories is that by their very nature, there aren't enough words, so-to-speak, to really develop characters. In this case, though, the author does an admirable job of character development. It becomes easy to understand each character, his or her motives and the actions he or she takes. Given that she is breaking her team's rules because of love, what Diana does and how she does it makes perfect, even if surprising sense. Characterization is not given the short shrift here just because it is a short story. Overall, this is a taut, well-crafted story. The author probably made a mistake in the use of "anthropologist" instead of the more likely "paleontologist," and the chance that the killers would be on-hand to catch someone back in the age of dinosaurs given other facts revealed in the story would be statistically close to zero. However, these are two minor glitches which don't really affect the overall story. And the overall story is quite enjoyable and even thought-provoking. Time travel is an interesting concept, but the idea of love versus duty is an age-old issue about which this story gives a fresh and new look. 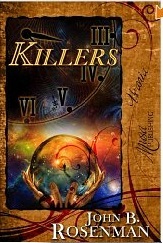 For more reviews or to buy Killers from Amazon.com, click here.